Nowadays, a lot of corporations use web agencies to create web campaigns and websites mostly due to the lack of time, but they also rely on the professionalism that those agencies can offer. But even corporations agree that creating a site with an agency can be expensive, but also inflexible. With a third party involved, you lose a lot of agility. 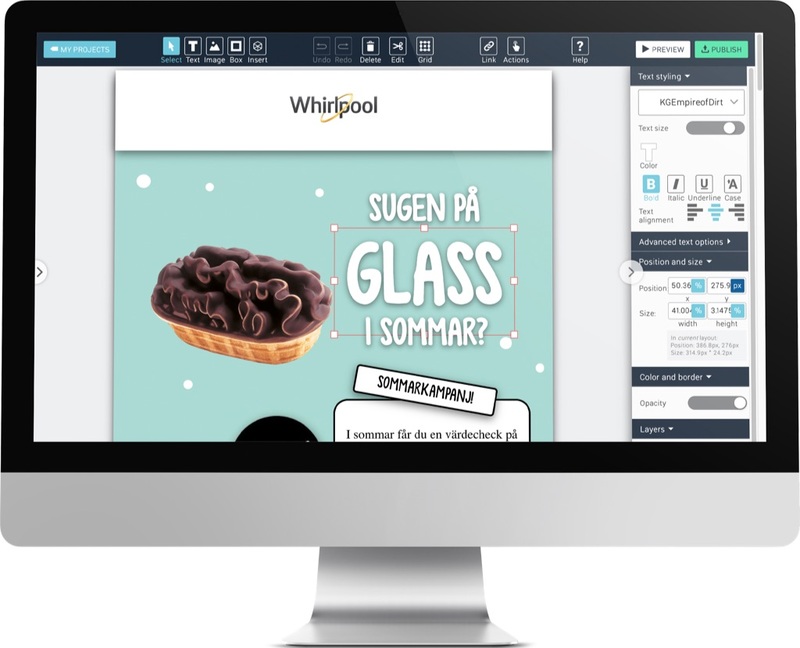 That’s why Whirlpool decided to think outside the box, and the company used Weld as their go-to website creation tool when building www.whirlpool-hemglass.se. 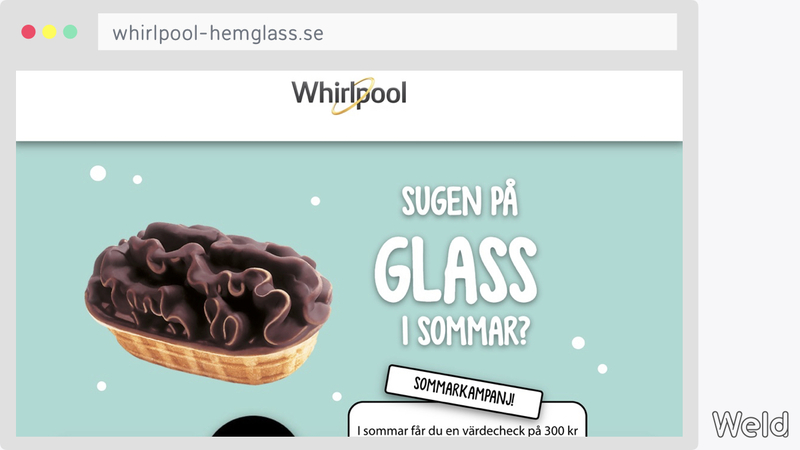 According to Katarina, Digital & Go to Market Specialist at Whirlpool EMEA, the company wanted to find a quick way to showcase the partnership between Whirlpool and the ice cream company Hemglass. Whirlpool had created the innovative FreezeControl technology, and there’s no better way to showcase it than with ice cream. Building the website itself wasn’t a problem because Weld offered all the tools needed for a quick and seamless website design. Whirlpool had design elements from their print campaign as a starting point and could use them to create but also publish the website in Weld. Whirlpool usually creates its own websites centrally, however they opted for Weld for this particular project. According to Katarina, it’s a very handy and affordable way to create a campaign website. The tool doesn’t require any coding skills and it is easy to use for a fast setup of a site with a great result. “It was really valuable that you can publish a website instantly and see changes in real time”, says Katarina. It was easy to create the new microsite for the products offered by Whirlpool, and the company said that they will most likely use Weld in the future as well. Why did a big company like Whirlpool focus on using such a tool instead of working with a digital agency? Creating everything manually at an agency is a lot more expensive and time consuming. That’s why it’s a very good idea to rely on some third-party solutions that can come in handy. Whirlpool wanted to find a good and reliable solution that would deliver exactly what they want. “The main thing was that it was so fast and frictionless to create a local campaign site where we could have full control over the content, design, and updates”, says Katarina. They opted for Weld because it’s is a visual CMS which makes it very easy to create visual, interactive and animated content. Whirlpool did require the integration of many visual elements that showcase their products, and Weld offered a good solution to do just that. They even could include a sound effect, the well-known audio signature of Hemglass. The key takeaway is this: you don’t have to hire an expensive third-party agency, using a tool like Weld can get the job done just as well. You pay less for the service, the workflow is faster, and the results are impressive.